Isidore-Lucien Ducasse (1846-1870) was a Uruguayan-born French poet who, under the pseudonym Comte de Lautréamont, published Les Chants de Maldoror in 1869. Although he died as a relatively unknown writer, his works resurfaced and became a crucial inspiration for the burgeoning surrealist movement in the early twentieth century. It was while reading Les Chants de Maldoror that French surrealist André Breton discovered the singular phrase that became foundational to the surrealist doctrine of objective chance: "as beautiful as the chance encounter of a sewing machine and an umbrella on an operating table." This metaphor captures one of the most important principles of surrealist aesthetic: the enforced juxtaposition of two completely alien realities that challenges an observer's preconditioned perception of reality. German surrealist Max Ernst would also refer to Lautréamont's sewing machine and umbrella to define the structure of the surrealist painting as "a linking of two realities that by all appearances have nothing to link them, in a setting that by all appearances does not fit them." Lautréamont’s prose poem is comprised of six cantos that recount the epic of the anti-hero Maldoror who seeks to combat the forces of God and humanity. The work is full of sadistic, cynical passages that work in conjunction with ironic references to classical authors such as Homer, Dante, and Shakespeare. Surrealists identified themselves with Lautréamont’s use of black humor and celebrated the ways in which he defied convention, ridiculed values and standards, and challenged the construct of absolute reason. 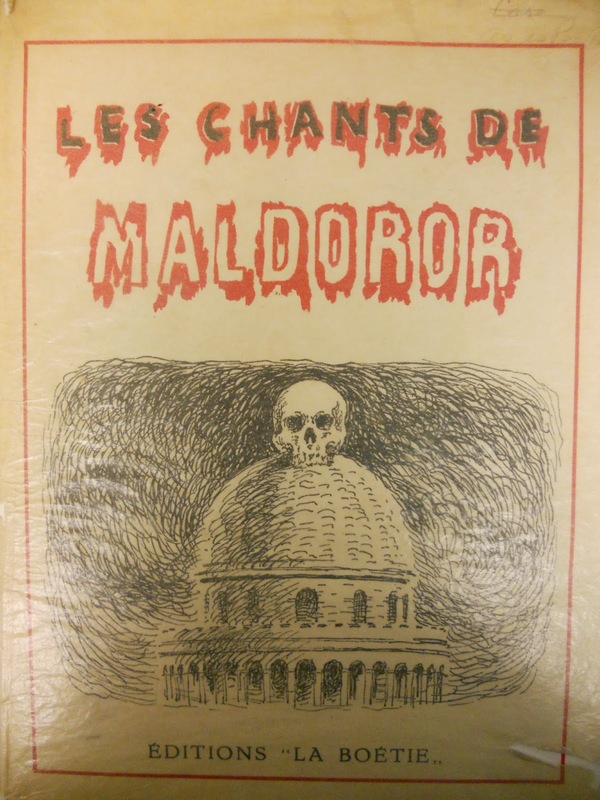 Belgian surrealist René Magritte drew a series of full-page illustrations and vignettes in a caricatural style for a 1948 edition of Les Chants de Maldoror that can be found here at Rauner. To read the famous passage from Les chants de Maldoror that inspired André Breton to represent surrealism as “the chance encounter of a sewing machine and an umbrella on an operating table,” ask for Ilus M276d and turn to page 166. Belgian surrealist René Magritte drew a series of full-page illustrations and vignettes in a caricatural style for a 1948 edition of Les Chants de Maldoror that can be found here at Rauner. To read the famous passage from Les chants de Maldoror that inspired André Breton to represent surrealism as “the chance encounter of a sewing machine and an umbrella on an operating table,” ask for Illus M276d and turn to page 166.